Many of you have already started on your Clean Eating journey by committing to our Clean Eating 30 Day Challenge. For some, clean eating is already a normal part of everyday life where refined and highly processed food is avoided and natural, whole foods are eaten 80-90% of the time. However, for lots of people this is a completely new experience, or the first time that 100% commitment has been given to try out this way of life after a long time contemplating it. The thought of completely changing the way you eat might seem a little overwhelming or even scary to begin with but once you have made up your mind that this is what you want to do, you can be filled with a great sense of excitement and determination to succeed. The first few days of a challenge are always filled with hope and promise until you reach about ‘day 3’. Day 3 is never my favourite day. 3 days after I gave birth to my eldest son the hormones hit me like a tonne of bricks and I spent most of the day crying. 3 days after I stared my 21 day vegan cleanse last January I felt utterly miserable and 3 days after I started blogging, I was ready to give up. Sometimes the excitement of committing to something new can wear off and the reality of the challenge ahead can feel like a heavy weight to carry whether it’s day 3 or day 23. This can happen for a number of reasons. A fear of failure. You might have tried doing something new before and given up. Feeling lonely in your new lifestyle whilst everyone else carries on with your old lifestyle. Procrastination/tiredness/lack of preparation can leave you feeling stressed and lost. Not seeing fast enough results of your hard work and sacrifice. With this Clean Eating Challenge you can succeed. Don’t be afraid to fail, it is not possible to fail with clean eating. It is not a diet that starts and ends, it is a lifestyle that you can learn and develop over time. You are not expected to eat clean 100% of the time. You have Flexi Days, days where you can indulge and celebrate special times in your life. Even if you took 6 Flexi Days during this challenge, you would have still achieved 80% clean eating for the month. That’s pretty great! It is never fun being the only person who eats clean in your family or work/friendship circle. It can get lonely. But you are eating that way for YOU, no one else. When you are tucking into your quinoa salad and your friends/family are enjoying their burger and chips, just remember that you are one meal closer to your goal and you never know, your healthy eating habits might just rub off onto the people around you. Starting something new requires a little more effort in the beginning and when something is not yet a habit it can seem like a LOT of work. The extra time and effort it takes to start something new always pays off in the end, so don’t give up! Change doesn’t just happen overnight, it takes time. I find it hard to stay motivated with fitness goals because my body doesn’t change fast enough. After one plank I want killer abs but it just doesn’t work like that. Sometimes it can take weeks or months to be able to see or feel the difference that has been made by our new way of life. “Never give up on a dream just because of the time it will take to accomplish it. 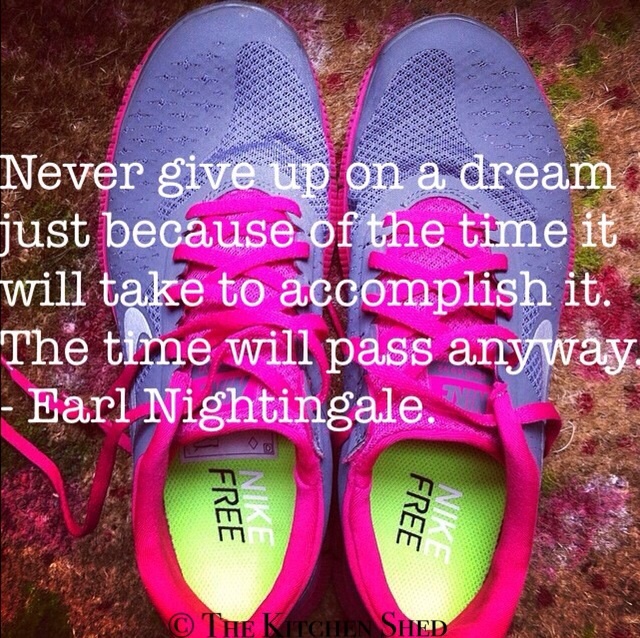 The time will pass anyway.” – Earl Nightingale. Unfortunately we are not all lucky enough to have a supportive network of people around us. If people are telling you that you cant, or wont… Show them that you can and will. Stay away from negativity and surround yourself with positive energy, even if that energy has to come from within. Lastly, make sure you are eating, drinking and sleeping enough. Feeling constantly tired and hungry is miserable so listen to your body and give it the good things that it needs. Wherever you are in your clean eating journey, look out for these signs and nip them in the bud straight away. It is not supposed to be a miserable experience, it is supposed to be an amazing, life changing experience where you can see and feel the difference in your body and overall health. Create a motivational board with pictures and quotes which will remind you of your dreams and goals. Keep motivation quotes or pictures around the house were you are likely to see them like on the fridge or bathroom mirrors to help keep you focused throughout the day. Create an Instagram account where you post pictures of the food you eat daily so you can keep track of your progress as well as find hundreds of new and inspiring ideas from others. Keep a food and fitness journal so you can see how far you’ve come. Talk to your friends and family about what you are doing and share recipes and ideas with them. Start your own Facebook page to track your progress. Although Facebook makes it hard to reach all of your followers, you can still receive a huge amount of support and ideas from those who find your page. One of my favourite Facebook pages to follow is Neon Runner. Check out Pinterest for new ideas and recipes to keep food fresh and exciting. Set yourself daily goals that are realistic and achievable and be proud of every step you take that brings you further to your end goal. Get out and get active. Getting your daily does of Vitamin D and raising your heart rate both help to release your happy hormones and help you have a clear mind. Think happy thoughts. Stay away from negativity and keep a positive frame of mind. Be kind to yourself, and be proud of yourself. I hope that you are able to use some of these ideas to help keep you focused and motivated and don’t forget that you can also use me! I am always here to cheer you on and celebrate your success. Find me on Facebook, Twitter and Instagram and of course, right here on blog. Yes! Finally something about Skype Tech Support Number. This is very interesting, you’re a very skillful blogger. I joined your feed and I can’t wait to find more of your fantastic posts. Plus, I shared your site on my social networks!